Two pine trees commemorate those who fought at Gallipoli during World War One. The Lone Pine was a solitary tree on the Gallipoli Peninsula in Turkey, which marked the site of the Battle of Lone Pine in 1915. 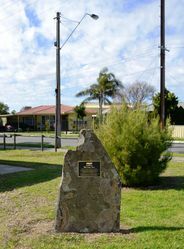 This battle involved some of the fiercest fighting in the Gallipoli campaign and the last tree was destroyed in battle. At the Lone Pine Cemetery on Gallipoli Pensinsula, a solitary pine was planted in the 1920s to symbolise the Lone Pine. 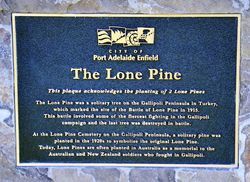 Today, Lone Pines are often planted in Australia as a memorial to the Australian and New Zealand soldiers who fought in Gallipoli.